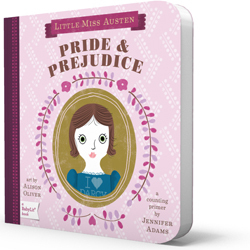 Introduce your little bibliophile to the romantic world of Jane Austen in Pride & Prejudice: A BabyLit Counting Primer. Stroll through 1 English village to meet 2 rich gentlemen and discover what happens when the 5 Bennet sisters encounter 4 marriage proposals! Alison Oliver’s charming illustrations accompany Jennifer Adams’ clever, simple text to make this take on a beloved classic perfect for little ones.